Water liability in the land of the dry — not-so-novel concept to control water use amongst the citizenry. The 19 people gathered at the community centre in Santa Cruz, a parched beachside city south of San Francisco, faced a crash course in rainfall statistics, reservoir levels, pump technology, meter reading, mandatory restrictions and conservation tips. At the end awaited a written test — and then freedom to leave, their fines forgiven. The class this week was part of a pioneering effort to curb waste, modelled on traffic school where offending motorists learn about road safety in return for reduced fines. California residents who let their green lawns turn brown and brittle will no longer face the possibility of fines for an unkempt yard under a new law to encourage water conservation during the state’s drought. The measure, signed on Monday by California Governor Jerry Brown, prohibits a city or county from imposing a fine on a homeowner for the failure to water a lawn or for having a brown lawn during the drought emergency. Assemblywoman Cheryl Brown, who sponsored the measure, said she knew of a number of cities and towns that had been leveling fines on homeowners for allowing their grass to go brown even as state officials have asked the public to “severely limit” outdoor water use this summer. Up here along the burly shores of Northern California, we don’t worry much about green lawns — marijuana farms the water-use destabilizer, but our climate tends to off-colors, more gray-than-green. 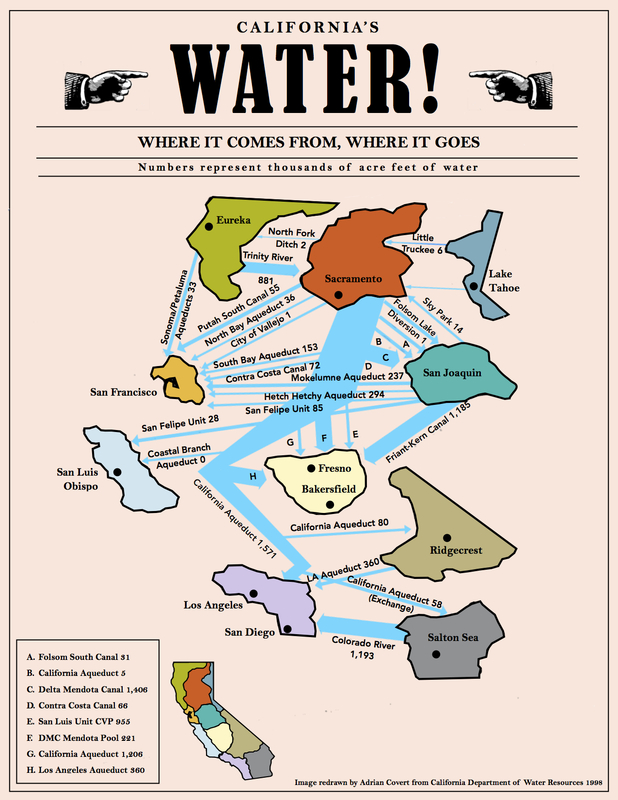 As a resident in the unincorporated county, I get my water via the McKinleyville Community Services District, which in turn, purchases it wholesale from the Humboldt Bay Municipal Water District, located south in Eureka, which pulls from the Mad River Watershed — in a nutshell. Those regulations, implemented by local authorities, will most likely include the cities and towns here in Humboldt County, even though the county’s primary supplier, the Humboldt Bay Municipal Water District, has too much water on its hands. “We do have a surplus of water because of the pulp mills not being in existence,” said John Friedenbach, the district’s business manager. Twenty years ago there were two thirsty pulp mills on the Samoa peninsula, consuming roughly 50 million gallons of water every day as they converted wood chips to pulp. But no more. Regardless, the district will maintain rights to that water until at least 2029. If, at that point, the region can’t demonstrate a continuing beneficial use for those tens of millions of daily gallons then the state could take those rights back. That’s a long-term problem (slash opportunity), and the district’s board has been exploring various options. The whole situation is enough to make an economist squirm: pent-up demand across the state and excess supply here in the northwest corner. Isn’t there some way to take advantage of the situation? Quite possibly, yes, said Friedenbach. For years now people have suggested selling water to other districts, exporting it in giant water bags via barge, and Friedenbach said that remains a possibility. District staff also commissioned a study on pipeline distribution, either south through Mendocino and into Sonoma County or east, tapping into the California Water Project. The projected cost of that project would make our water competitive, price-wise, with other potential extraordinary measures such as desalination. “Those are long-term possibilities,” Friedenbach said. District Business Manager John Friedenbach said that the district’s industrial customers consume anywhere from 60 to 80 percent of their retail water, with its 180 residential retail customers using the rest. While their May conservation figure of 29 percent is the highest locally, Friedenbach said it is irrelevant as the district’s June figure may show an equally large spike in water use — and that’s the month when the fines come into play. “(Industrial) volume is so large that even if the residential customers conserved 4 percent, it’s not going to be enough for the whole (district) to achieve the 4 percent,” he said. The district has not yet been able to address this issue with the state, Friedenbach said. A drought drowns…well-schooled the shame.